Spot silver achieved our end of year target in spectacular fashion on a hugely volatile day which saw the spot silver price hit a high of $29.34 and a low of $26.46 before closing marginally lower at $27.32 on the day. This volatile price action has left us with a colossal shooting star candle on the daily silver chart which can really only signal one thing: namely, a pullback and reversal lower in the short term. Indeed in today’s silver trading session we are already seeing a potential confirmation of this analysis and should today’s price action close on the daily chart as a long leg doji candle then this will add further weight to this view and validate yesterday’s signal. 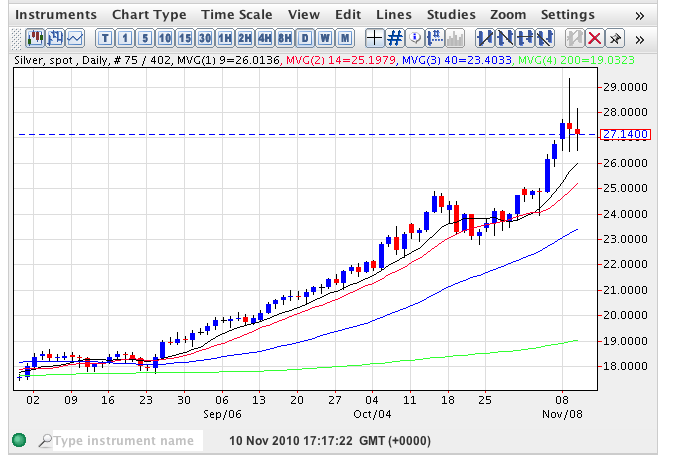 The question, of course, is the extent of this re-tracement and the first point is likely to be a test of the 9 day moving average which currently sits at $26.02 per ounce. If this fails to hold then we may see a consequent move lower to test the 14 day moving average at $25.20 and the immediate platform of support in this price area. Despite yesterday’s signal the longer term outlook for silver still remains positive and provided the above technical levels hold then the longer term trend should remain in place. So, in summary, expect a short term reversal, possibly as far as $25 per ounce or thereabouts, and thereafter a recovery for the commodity to close, probably, somewhere near our original year end target of $26.50 per ounce.